When I was young, my Dad kept a beehive on our acreage in rural Alberta. I loved sitting cross-legged in front of the hive. I enjoyed more than just the honey; I liked having them around (though, the honey is great too). At the time, my Dad was using a traditional langstroth hive that required lots of management. After all, shouldn’t bees know a thing or two about managing bees? Despite some domestication, one might expect that millions of years of evolution may know a thing or two about hive management! Could there be a better beehive out there? Couldn’t there be a design that works with (and benefits from) natural honeybee behaviour? 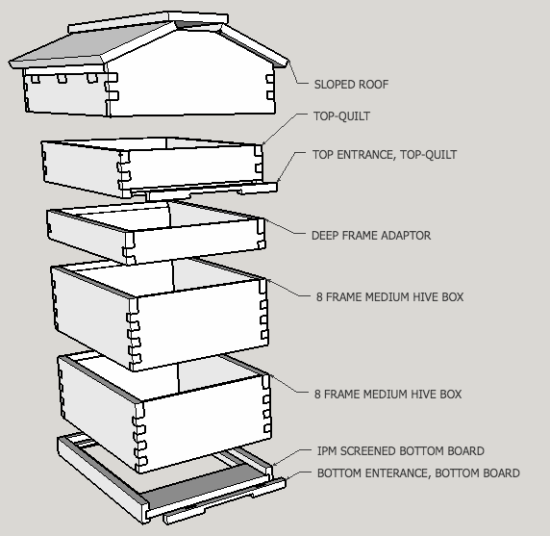 Langstroth hives designed for beekeepers. I’ve already written extensively about standard beehive design flaws – so I won’t go into depth here. For that, check out “5 Common Hive Problems and How To Fix Them” on my Beecentric Hive website. You might also like “11 Beekeeping Tips Every Beginner Should Know” but I digress. Let’s get to Warre Hives. Warre hives are constructed and managed in ways that mimic natural honeybee behaviour. Working with bees results in less work and happier, healthier colonies. At 12’x12’x8′ the smaller Warre boxes are easy to handle. However, Warre’s real insight was to base his hive’s dimensions on the natural size of the brood nest. Sizing the hive to the bees makes it easier for the bees to heat and assess honey stores. Warre hives are foundationless. The bees draw natural honeycomb on top-bars. It’s also believed that natural cells are smaller and may decreases mite infestations. Extracting honey by crushing the comb means that it can’t be reused and won’t become a vector for disease. As a bonus, clean comb renders excellent beeswax. Warres hives are classically nadired (expanded by adding empty boxes to the bottom). Made possible by smaller boxes, Warre hives take advantage of the bees natural tendency to build from the top-down. Adding empty boxes to the base of the hive expands the brood nest and allows the hive to grown downwards (their natural tendency)eaches as the colony expands. The effect is that Warre hives act like a never ending tree-trunk; infinitely growing downwards. A happy result is that the top boxes fill with honey and no queen excluder is necessary. Honeybees build downwards but reverse their direction in the Winter. While they build comb from top-down, they consume it bottom-up. The effect is that an over-wintering hive will ball together and rise with the heat (consuming honey as they go). Quilt boxes protect the top of Warre hives. Unlike solid roofed langstroth hives, Warre hives have a breathable top box called a quilt. The quilt provided ventilation and insulation from the elements. Honeybees add or remove propolis (a stick substance gathered from plants) to regulate the airflow and humidity inside the hive. Overall, the Warre hive is a great design, but that’s not to say that they don’t also have some challenges; non-standard equipment, as an example, is hard to come by (I had to build by own). Full disclosure, I kelp honeybees in Warre hives for a few years but abandoned the classic Warre design for a modified Warre that uses standard Langstroth frames. Click here for more information on the Beecentric Hives that I now use. In either case, it is essential that any method of natural beekeeping works with the nature of these beautiful insects. I am just completing a Warre hive but am a bit stuck on the quilt box. My understanding is the top edge of the quilt box is flush with and hard up against the underside of the roof cover board. How then do the bees propolising the burlap control the air flow and how does the quilt vent and dry? Hi, Andrew, where is your roof cover board? Cover boards aren’t often used with Warre hives; my screened-quilt box sits directly on the bars of the box below it. The quilt is then filled with loose straw or woodchips and the open-roof it added on top.